If you are on the Design Diva's Oldie but Goodie Blog Hop, you should have arrived here from Tenia Nelson's Blog. If you happened on my blog and would like to do the hop, it starts at Sue Morris' Blog and from there you just follow the links! The Design D.I.V.A.S are a group of talented papercrafters who formed a group first on SCS, and now on Facebook to share our common interests in all things paper! The meaning behind the group's name of DIVA is: Divine, Inspirational, Virtuous, Artistic (or Annointed) sistahs! Don't you just love that? I was honored to be invited to join! We were challenged this week to use some of our old stamps and supplies that have not seen any love in at least 6 months. I pulled out this Impression Obsession Clear stamp set I won about a year ago from Stampers Dream, and have not had the chance to ink it up even once! I guess you could say it is my NEW but old stamp! So this gave me the reason to do so, and I had a blast coloring it. I stamped it on Ex-Press It cs, colored it with Copics and matted it with BasicGrey Green at Heart, which also is old now! I used a base of Gina K Pure Luxury and used designer paper from BG Sultry as well. I used an EK Success punch and May Arts twine. You can't see it in the photo but the flowers are highlighted with Spica Pens for a little sparkle. The sketch I used is from Card Positioning Systems. I had a blast using my "new" old stamps and I hope you've enjoyed this hop! From here hop on over to the talented and sweet Deb Felts to see her oldie but goodie! Thanks for stopping and for blessing my day with your comments! This is beautiful... What a great choice.. I love the paper you chose and the light coloring on the stamped image.. What a great image..Hugs and see you tomorrow. Oh what a gorgeous card!! You do amazing work!! what a gorgeous match of coloring and dp - this is wonderful!!!! Beautiful card Grace!! The dp is perfect with the flower image. Thank you so much for playing along with us at Claudia & Co.
Gorgeous card! I just love the colors and papers you used. Lovely colors and the perfect image for this dp- (one of my faves). Beautiful card! oh Wow Grace this is gorgeous!!! this pretty paper is perfect for your colored image, great job! Beautiful card, Grace! I love the papers and the pretty image! Wonderful coloring and details! I am loving this image!! You colored it perfectly and showcased it with the perfect papers. Gorgeous! Grace, your card is beautiful! I love floral images and this one is awesome. Thanks so much for playing along in the OBG hop! Great card! I love the yellow. :) I always like your work! Thanks for sharing! Blessings!! Beautiful! Love how your flowers match that gorgeous patterned paper!! TFS! This card is sooooooo gorgeous!!! Wow!!!!! Grace, Gorgeous card!! I love how the coloring matches the dp perfectly! So, So Pretty. Everything is so nicely coordinated. Such a beautiful card Grace, love your coloring. GORGEOUS GORGEOUSNESS!!!! Wow!!! Your card is blooming perfection and makes me yearn for Springtime:o) I love it!!! What a gorgeously colored image that is brought to even more life with the poppy field background image. Hi grace!!!! Oooooh...this is simply FABULOUS!!! I LOVE it!! it's so cheerful and immediately brought a smile. :) Thankyou so much for being a part of the hop! This is wonderful Grace - love the dp, it is amazing!! Beautifu card. I love the papers you used and your coloring technique. WOW!!! This is totally stunning!!! I love everything about this!!! Oh so lovely!! Great colors and a wonderful design. Very pretty. I love the image you used and your coloring is so soft and pretty. Thanks for joining us in the Meljen's Designs Challenge this week. Hi Grace, Oh My! your card is so lovely! the dp is the perfect frame for this fantastic image.. I just joined the group too..
Don't blog so could't join in the Hop today, but do plan to join in the fun on our FB page! What a lovely bouquet....such beautiful coloring on the blooms!! Stunning card Grace, I love your use of the Green at Heart papers, that is a beautiful image and your colouring of it is perfect. 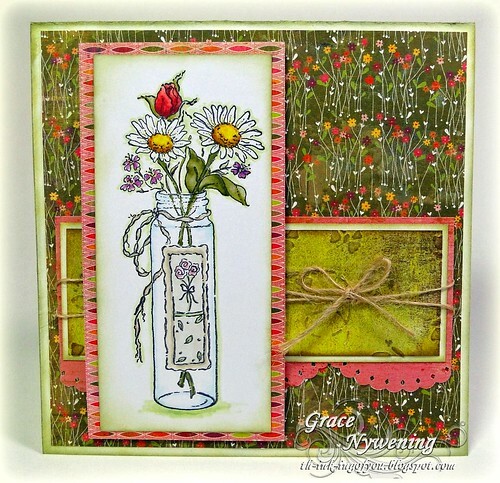 Your card is just beautiful Grace........love your pretty colouring of the blooms and the background paper is just the perfect one! This reminds me of a Minton China Teaset!!!! Lovely. This is beautiful Grace!! I just love the paper you chose and your light coloring of the image. Beautiful layout!! The twine is perfect. This is a beautiful card. I love that DP with the pretty bright tiny flowers on it. I love how you have the string made into a bow on that other nice DP. Your coloring looks so lovely. Beautiful Grace, please contact me at jkwallace@mchsi.com you left a comment for me on my blog about some header? I'm totally lost, have no idea what you are asking me to do. Oh Grace this is so pretty. The image matches the dp perfectly and your watercoloring has a wonderful softness to it that I just love!! What a beautiful card! I love the paper and the image. I actually hopped over to say happy birthday. I was browsing some of my fave blogs and Chris said to hop on over and tell you happy birthday!! What a lovely blog you have, loving the music!!!! Hope your day is wonderful!! Happy Birthday, My Friend. I hope you have a marvelous day and celebrate yourself...for you are a wonder! He created you...that makes you a masterpiece! This is so beautiful! I love the dp! It is so beautiful and full of one of my favorite creations...flowers! I really love what you did with this card! The layers are beautiful...and I love how you chose where to add color on your beautiful flowers. Amazing technique I have not seen before. Much happiness to you on your Birthday! I love it Grace! Wow, it is beautifully colored and I love that paper. I have some of it, but it is stashed away! Grace, this is a beautiful card!! What a fun hop this has been, so much talent!! So very pretty! makes me think I am in a garden surrounded by pretty flowers! what a pleasant thought for a cold windy January day! thanks for warming me! So pretty. Makes me long for spring. Thanks for sharing this with Claudia & Co.
Super card! your coloring is splendid! Thanks so much for joining us at Meljen's Designs! This is so gorgeous, Grace! Love the papers that you chose and that image! Thanks for joining us at Oldie but a Goodie Challenge! Great! Fantastic. I love the image and the wonderful background paper. Oh, wow!! This is gorgeous! The daisies look like they could be picked off the page! Great work! Thanks for joining in the Copic Creations Challenge! Congratulations on this beautiful card Grace! I feel like I am in a field of beautiful flowers. :) Thank you for joining us at Claudia & Co. this week! Lovely card! sorry not to comment earlier, comment box would not open for me! Thank you so much for joining Quirky Crafts 'In The Spring Garden and to use pink and green',don't forget to come back later today to vote for your top three and ask your blogging buddies to vote for you! !